VIRsiRNApred is the first antiviral siRNA prediction algorithm. Our virus specific algorithm achieved Pearson Correlation Coefficient (PCC) of of 0.50 between actual and predicted efficacy of independent 345 viral siRNAs dataset. Whereas best of existing general mammalian siRNA prediction methods merely showed a PCC from 0.05 to 0.18. Developed using new dataset of experimentally proven 1725 siRNA/shRNA having quantitative efficacies under heterogeneous experimental conditions. Our dataset include siRNA from as many as 40 different Human viruses. SVM predictive score is provided against each siRNA as inhibition efficacy. siTarConserve tool to check conservation of predicted siRNA with reference viral genomes. For finding off-target of predicted siRNA, user can blast the siRNA sequence in the Human genome or nr database. Predicted antiviral siRNA of HIV, HBV, HCV, influenza and SARS. 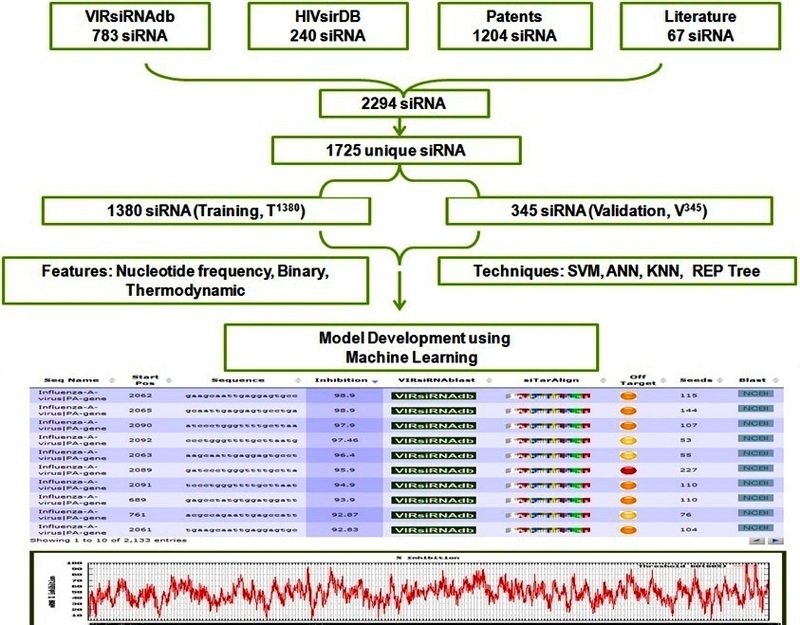 VIRsiRNApred algorithm would be useful in predicting potent viral siRNA and siRNA based antiviral therapeutics development. VIRsiRNAdb -a database of viral siRNA/shRNA. HIVsiRDB -a database of HIV inhibiting siRNAs. siRNApred -prediction of mammalian siRNA efficacy.